The recount ended earlier Sunday, leading to Nelson's concession. Nearly two weeks after Election Day, Republican Gov. Rick Scott has won Florida's Senate race. 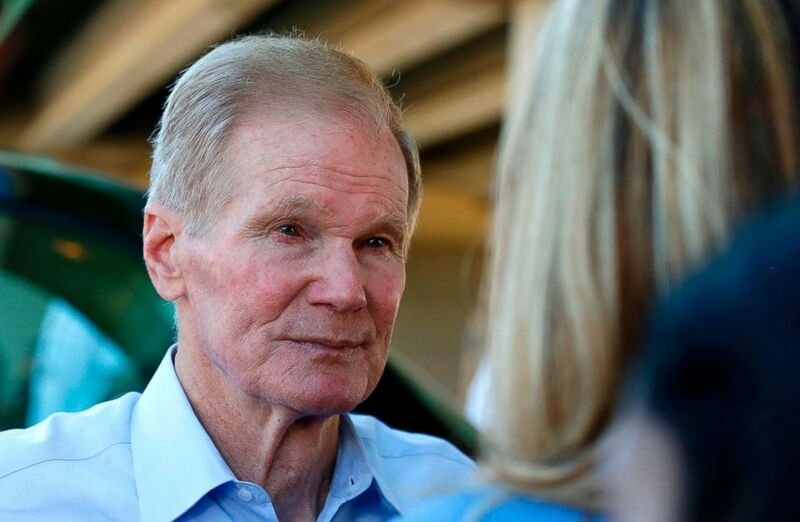 Sitting Democratic Sen. Bill Nelson conceded to Scott Sunday afternoon, recording a YouTube video in which he acknowledged defeat. Nelson called Scott to concede, the latter said in a statement. President Trump congratulated Scott in a tweet, writing: "From day one Rick Scott never wavered. He was a great Governor and will be even a greater Senator in representing the People of Florida." It marks the end of a long and at-times messy vote recount that drew national attention amid reported irregularities in vote counting by county officials, problems with tabulation machines and missed deadlines. It also marks the end of Democrats' hopes in Florida's two high-profile elections this year. On Saturday, Democratic Tallahassee Mayor Andrew Gillum conceded to Republican Rep. Ron DeSantis in the governor's race. In defeat, Gillum drew praise from Trump on Twitter afterward. Recounting had stopped in that race after Thursday's conclusion of a machine recount. Senate recounting, however, had continued, with county officials hand-examining a subset of votes, checking thousands of them for voters' marks that could have been missed by scanning machines. Florida's 67 counties faced a noon Sunday deadline to finish hand-recounting ballots in the Senate and state agriculture-commissioner races. All of them made it, the Florida Department of State told ABC News. After the final round of recounting had finished, Scott still led Nelson by 10,033 votes -- a slightly narrower margin than the 12,603 by which he led after the first round of recounting was completed. 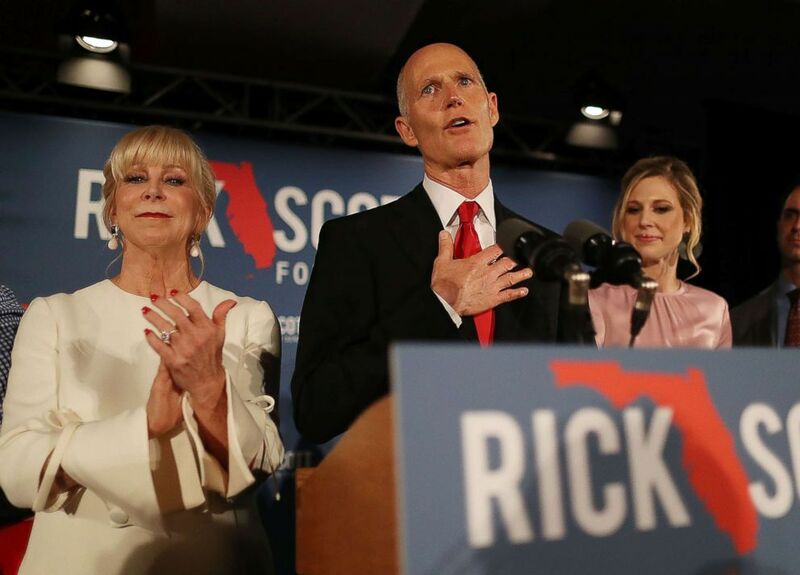 (Joe Raedle/Getty Images) Florida Governor Rick Scott speaks during his election night party at the LaPlaya Beach & Golf Resort, Nov. 6, 2018 in Naples, Fla.
Two counties in particular -- Broward and Palm Beach, both large, Democratic strongholds in South Florida -- drew attention and GOP criticism throughout the process. In Broward, Election Supervisor Brenda Snipes was sued successfully by Scott's campaign over her failure to provide results on time after Election Day. Her office reportedly intermingled 22 provisional ballots that shouldn't have been counted, within a batch of 205. On Thursday, the county failed to upload results to a state website after the first round of recounting, missing the deadline by minutes. Over the weekend, after Snipes's office had completed recounting in the Senate race on Friday but continued recounting in the state's agriculture commissioner race, she acknowledged her staff may have misplaced more than 2,000 ballots as it sought to finalize totals in that state-level race. Senate tallies had already been completed. "The ballots are in the building," she said at a canvassing board meeting on Saturday, seeking to reassure those in attendance. "The ballots are in the building." In Palm Beach, Elections Supervisor Susan Bucher said her counting machines overheated and stopped working multiple times, as the county raced to meet the state's 3 p.m. Thursday deadline in the machine recount. Palm Beach missed that deadline on Thursday and had to continue running the machines afterward. The manufacturer of the machines pushed back, suggesting county officials were running the machines in an unusual way, in comments to The Palm Beach Post. Palm Beach made Sunday's deadline by one second, Palm Beach Elections Supervisor Susan Bucher told ABC affiliate WPBF, showing a readout of her office's upload of results to the state website reading 11:59:59. Two rounds of recounting had ensued after Scott and Nelson were separated by just .15 percentage points after Election Day -- a narrow enough margin to trigger an automatic machine recount. With the race still close enough after Florida's first round of recounting concluded on Thursday, county election officials hand-examined a subset of votes since Friday, in some cases racing to meet the deadline. (Rhona Wise/AFP/Getty Images) Senator Bill Nelson speaks with the media about gun control near Marjory Stoneman Douglas High School in Parkland, Florida, Feb. 16, 2018. Florida's recount was the subject of at least a dozen lawsuits, as the campaigns, national political parties, and outside groups wrangled over the counting of late mail-in votes, considerations of voter intent when examining hand-marked ballots, and the physical security of ballots and tabulation machines at county election facilities where recounting was underway. The troubled process prompted incoming Florida Senate President Bill Galvano to tell reporters the state legislature would examine Florida's election laws for potential changes, ABC affiliate WPBF reported. Nelson's hopes dwindled late last week, as court challenges were struck down and as vote counting in Broward failed to yield extra votes. In that heavily Democratic county, some 26,000 more votes were cast in the state's governor's race, hinting at a possibility that hand-examining ballots there could yield votes for Nelson. But as that count finished Friday, he had gained just over 400 votes -- not nearly enough to overcome the deficit. Scott's win gives Republicans a net gain of two Senate seats in the 2018 midterms and a prospective advantage, heading into next year, of 52 seats to 47. Mississippi is currently holding a runoff in its U.S. Senate seat, to be held Nov. 27.